Living… in Brooklyn with her best friend Sophie until recently. Sophie moved out to live with her boyfriend Patch. Profession… aspiring professional dancer. She is having trouble picking up classes to teach at her dance company and is worried she might never do the thing she loves for a living. But maybe she is not cut out to be a dancer after all – she is not the embodiment of grace. She falls down constantly. Interests… knitting, playing backgammon, and traveling. Frances is planning trips to Sacramento, Paris, and her old school Vasser in search of direction. Some may say that she is running away from her problems. Though Frances might say she's running towards solutions. Relationship Status… dating a writer named Benji. But really the love of her life (in a platonic way) is her best friend Sophie. They used to say "I love you" constantly and did everything together. But they're not on the best terms right now. Frances complains to Sophie: "I held your head while you cried, I bought special milk for you, I know where you hide your pills. Don't treat me like a three hour brunch friend." Challenge… getting her life in order at the “old” age of 27. She's broke, she might not have a future in dance, she bounces around from sublet to sublet, and she doesn't even have Sophie to commiserate with. Will a credit card-funded trip to Paris provide the answers or just add more debt on top of all her problems? Personality… free-spirited and joyful. It's impressive that the universe has finally managed to get Frances down and depressed. She usually approaches life with a whimsical, wide-eyed happiness. She just needs a little more focus and maturity to make it to the other side of this particular rough patch. 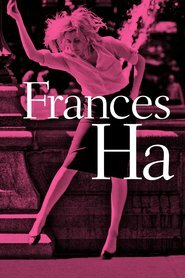 Frances Ha's popularity ranking on CharacTour is #744 out of 5,000+ characters. See our top-ranked characters and read their profiles.